I confess; I’m not a great lover of turkey. 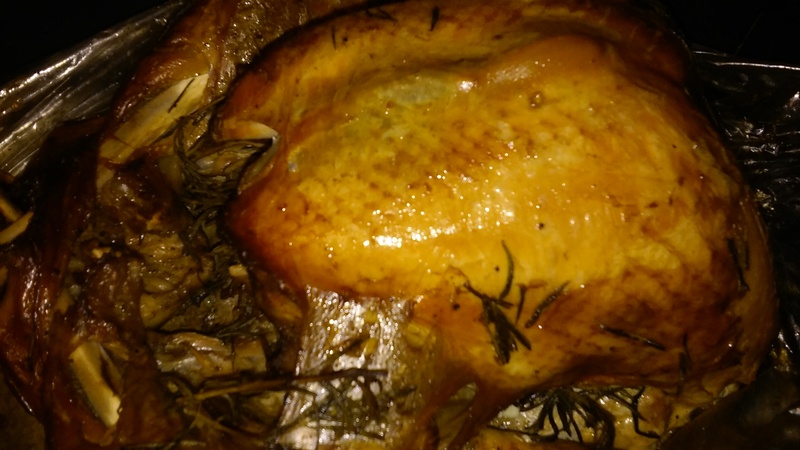 However, on Thanksgiving Day I indulged in a very delicious, moist and succulent bird. Shhh!! My friend was on top of her game and ‘throw it down!’ I found my self returning for seconds. The side dishes served were: creamy macaroni/cheese, sweet and smooth sweet potato bake, hot kale salad and of course the tart/sweet cranberry. All those sides gave a beautiful balance to the star of the show (turkey). On returning home, I felt a tad guilty. I took a peek at my chicken as it perched on the bottom shelf. Somehow, it looked quite miniature. My intention was to do a quick roast of it the next day. You see, I placed it in an apple cider brine the a day before. I removed same, rinsed and stuffed it with compound butter consisting of fresh herbs of rosemary, thyme and crushed garlic. As my poor bird laid there I felt that I should find a way to perk it up and enhance the size and taste. Reflecting on the size of the turkey breast, I took my knife and made a slit in the center of my chicken breast. That didn’t satisfy me. I made quick scan of my surrounding trying to find a way to make it up to my bird. After all, I consume same most days of the week. In my peripheral vision, I spotted the bowl of gala apples. Why not? Immediately, I grabbed a couple and removed the pits with my knife tip and stuffed them with some fresh herbs. I smiled, I felt like I was making it up with a lover. I drizzled a little olive oil and massaged the interior and exterior of my abandoned bird (well, in my mind). I placed my dear bird on wire rack so that all the heat could circulate throughout and yield a crispy skin. 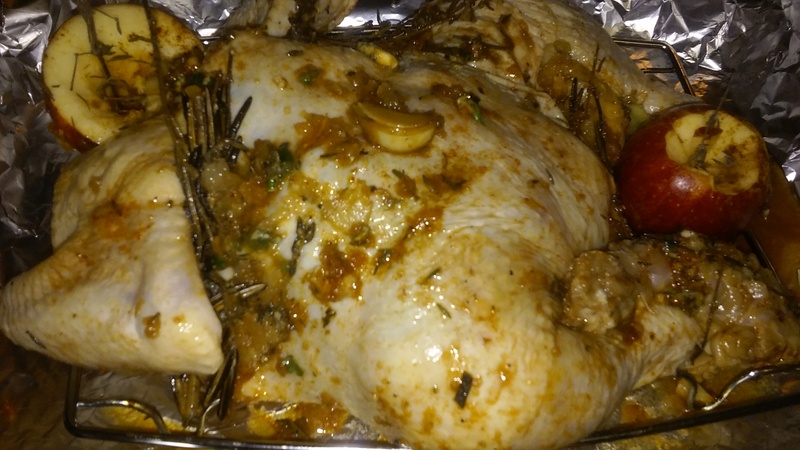 Chicken was then placed on foiled baking sheet and roasted in a preheated 375 degree oven for approximately an hour (turning once). It was basted with a sauce consisting of little apple cider, ketchup, soy sauce, balsamic vinegar, and dried seasoning. Oven was turned up to 420 for another 15 minutes to arrive at a crispy and brown finish. Though my beloved bird was small in body, I must state I loved all the amazing flavors. She has a way to adapt to any spice, and flavors come her way. She is so forgiving and always seem to satisfy me. I can’t promise her that I will not stray and test the waters with another feathery one. Deep down, I know she understands. Oh, I wish they would all just get along. After all, it’s just a once in a while kind of thing. Do I have to choose? Okay, I choose my dear chicken.